These fish are found at the benthopelagic level, in the midnight zone. Scientists have discovered that this type of fish has high levels of a chemical called TMAO in its body. All ocean creatures have this chemical in their systems. Its presence helps to maintain hydration levels of the body tissues while living in all that salt water. Otherwise, water would move from areas of low salinity (the fish's body) to areas of high salinity (the surrounding ocean water). Without this chemical fish would be dehydrated by the surrounding ocean water. TMAO, and its breakdown product TMA, are the chemicals that make marine animals smell fishy. 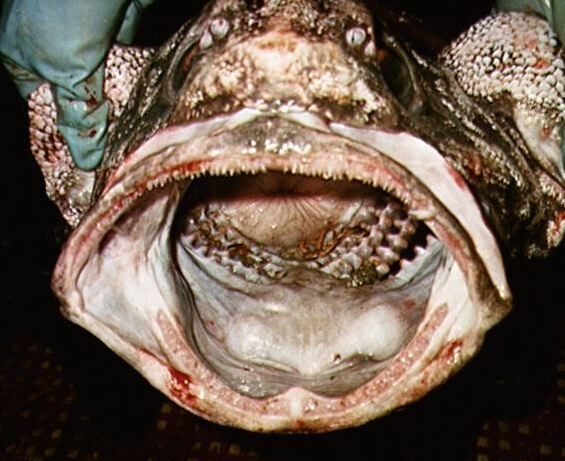 This guy with the big, creepy mouth is a giant grenadier fish. This species is usually found living just above the bottom of the ocean. They swim slowly over the sea bed searching for live prey, as well as carcasses to eat. Having really high levels of the smelly chemical compound TMAO must make the rattail not only ugly, but really stinky, too!